Nigel George Planer is an English actor, comedian, novelist and playwright who is best known for his role as Neil in the cult BBC comedy The Young Ones and as Ralph Filthy in Filthy Rich & Catflap. He has appeared in many West End musicals, including original casts of Evita, Chicago, We Will Rock You, Wicked, and Charlie and the Chocolate Factory. He has also appeared in Hairspray. He won a BRIT award in 1984 and has been nominated for Olivier, TMA, What’s On Stage, and BAFTA awards. A founding member of the London Comedy Store and original member of The Comic Strip – pioneers of the alternative comedy movement in the United Kingdom. Planer appeared with Peter Richardson as part of the double act “The Outer Limits”. Planer and Richardson also wrote the That’s Life! parody on Not the Nine O’Clock News. Over the next 20 years he went on to star in film, theatre and television. With Christopher Douglas, he created the spoof actor character “Nicholas Craig”, who appears in book, radio, TV and articles as well as live; most recently at the Royal Festival Hall, London, in Stewart Lee’s At Last the 1984 show. Planer is also the author of several books, plays, radio plays, and TV scripts as well as a small volume of poetry. 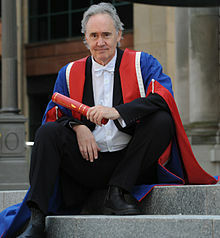 He was awarded an Honorary Doctor of Arts degree from Edinburgh Napier University in June 2011 (Pictured Below). In June 2018 he reunited with actor Adrian Edmondson to write and star in a new play, as drama school friends now rapidly approaching their sell-by dates as veteran actors. This entry was posted in All the Nigels and tagged actor, comedian, novelist. Bookmark the permalink.